At only 19 years of age, Andi Naude has already made herself known on the World Cup circuit after finishing 5th overall during the 2014-2015 season. 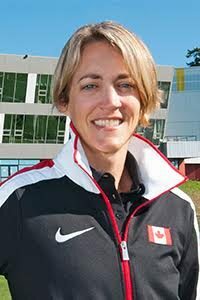 As the only mogul skier out of the West Coast on both the women’s and men’s World Cup teams, Naude takes pride in representing Western Canada. While finishing fifth overall in the world is an impressive accomplishment for such a young athlete, Naude has her sights set even higher for the upcoming seasons. The Penticton, B.C. native has been working on perfecting a back full (a backflip with a 360 rotation) that will help her stand out from her competitors. Naude used the trick for the first time at the Calgary World Cup in January and then again the following month at the World Championships in Austria. For this upcoming season, Naude’s main objective is to continue improving and to become more consistent with the technical aspects of her skiing, including when attempting the back full. Being an athlete who is still fairly new to the team, Naude gained a lot of experience this past season. Participating in only the second World Championships of her career, Naude felt that the competition was a valuable learning opportunity and great exposure to a big stage event even while finishing a disappointing 34th and 12th in the moguls and duals moguls events, respectively.